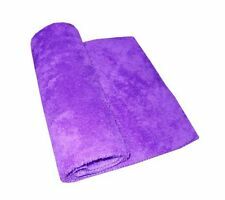 Price is for 1 set / 2 towels of 1 color ! Color:Violet with gold embroidered decoration;. For a stylish bathroom or a perfect gift! Organic Soft Linen Bath Towel.Handmade.Quick dry and lightweight.Size 28" X 58"
1 Lavendar Kitchen/Hand towel. Eeyore Inspired. and 1 Lavendar wash cloth. Hand towel approx. 15 1/2"x 25 1/2". Do not use fabric softeners. They may decrease the fluffiness and life of your towel by breaking down the fabric. Machine washable. Easy care machine wash and dry. 100% Cotton. - Always use a mild detergent when washing towels. Hang it up in your suite or guest bathroom so it is always nearby when you need it. To keep your washcloth in top form, clean it in your laundry machine for stress free maintenance. Formulated to feel soft and cozy to the touch. POTTERY BARN KIDS HOODED BATH WRAP New with tags Color - LAVENDER/PURPLE Design - POLKA DOT a couple treads pulled out, very minor. priced accordingly, no return. Never been monogrammed or used or washed! Store at a smoke free and pet free home!